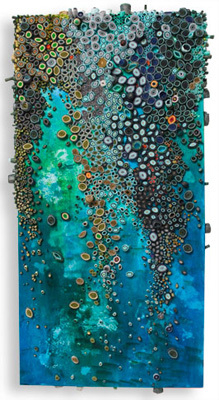 Amy Eisenfeld Genser plays with paper, paint, and glue to explore her fascination and obsession with texture, pattern and color. Evocative of natural forms and organic processes, her work is both, irregular and ordered. She constructs her pieces by layering, cutting, rolling, and combining paper. Sometimes she even adds metal and wood. Amy also works on commission pieces.